Hunting for sunrise is an interesting activity that usually become a main activity for tourists. This activity can also be done in various places, including Magelang which is the location of Borobudur Temple; the largest temple in Southeast Asia. But, hunting sunrise in the Borobudur Temple cannot be done by everyone. The main reason is, the entrance ticket is very expensive. Every visitor who wants to see the sunrise at Borobudur must pass through Manohara Hotel entrance with the cost starting from 275,000 IDR until 325,000 IDR per visitor. The sunrise view here is surely amazing. You can sit among the rows of Buddhist statues of Borobudur while waiting for the rising of the sun. No wonder that the tourists who have alot of money are willing to pay a fortune to experience this view. Then, what about the backpackers who still have limited stock in their bag? 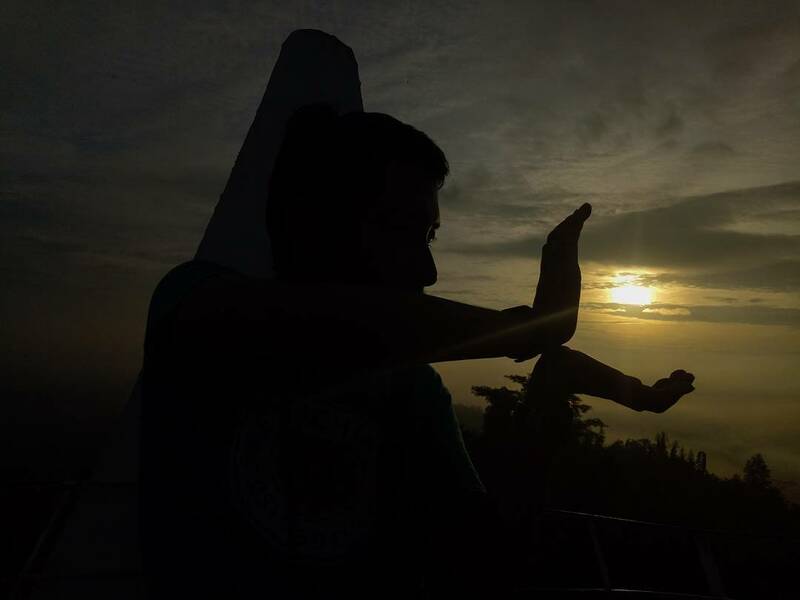 Bukit Rhema becomes an alternative for backpackers to witness the amazing sunrise view. Plus, you can watch the private sunrise here with definitely cheap fare. At Bukit Rhema, you can feel the atmosphere of hunting sunrise with calmer atmosphere. There will be no disturbance from other visitors like in Borobudur temple or Punthuk Setumbu. Interestingly again, you do not need to spend a lot of money to watch the sunrise in this place. Here, there is an old church building called Dove Church or better known as Chicken Church as a sunrise hunting location. In order to watch the sunrise from the Chicken Church, you only need to pay a ticket of 15,000 IDR for Local Visitor and IDR. 15,000 for Foreign Visitor. But the sunrise hunting activity in the Chicken Church can not be done every day. The management of the Chicken Church only provides this service on Saturday and Sunday. Chicken Church is divided into several floors. To enjoy the best view of sunrise, there are two locations to choose, those are, on the beak and crown of the building. From there, you will be able to see the sunrise decorated with Borobudur Temple from a distance. In addition, you can also see even more beautiful scenery around the church. Bukit Rhema is surrounded by several mountains, including Mount Sumbing, Merbabu, Suroloyo, Merapi, and Sumbing. The scene looks more exotic with thin fog covering the area around the hill in the morning. In addition to being a sunrise hunting location, the Chicken Church at Bukit Rhema is a great place to get instagrammable photos. Moreover, hunting sunrise here is only limited, either in place or time. You can also pose like Rangga and Cinta in the movie Ada Apa Dengan Cinta (AADC) 2 here. There are a lot of instagrammable photo locations that can be found in this Chicken Church area in Bukit Rhema. Some locations that are often selected by the visitors, including, in the beak and crown, on the outside of the building, or you can also get beautiful photos by posing on the stairs to the top of the building. There are important things to watch when visiting this place. Today, the Chicken Church has indeed served as a tourist attraction. Even so, the visitors must keep their behave while inside the building. Especially, because at the beginning of its construction, the Chicken Church is functioned as a house of prayer for Christians. Not only that, but also you must avoid the action of vandalism. This building has been abandoned since 2000. It is considered as a haunted building and there are several strokes made by the visitors. It is unfortunate if it is still continued. Bukit Rhema is located in Gombong Hamlet, Kembanglimus Village in Borobudur District, Magelang Regency. This hill is located at the west side of Borobudur temple, 2.5 km apart. The location of this hill is also adjacent to Punthuk Setumbu which is also a beautiful sunrise hunting place in Magelang. In order to go to Bukit Rhema, there are available parking areas in Punthuk Setumbu. Furthermore, you can continue the journey on foot to the Chicken Church which is about 200 meters away. Easy, right?